Is content enough? What about wonder? When I was in NYC earlier this month, I went to a pile of museums and galleries – the Met, MoMA, the Guggenheim, the Frick Collection, the American Museum of Natural History, the International Centre for Photography, the Pierport Morgan Library, the New York City Library and more. One thing that they inspired in common was a sense of wonder. I gaped, open-mouthed at the beauty, the history and the stories of the world. 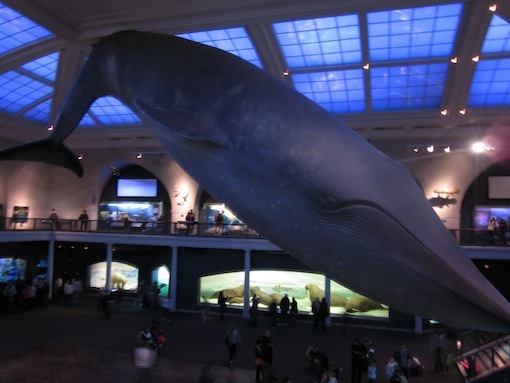 Sitting under the giant blue whale at AMNH, I felt a childlike reverence for the universe around me – the sort of feeling that opens your mind to learning, to trying to take everything in. It’s one of the most compelling reasons why people go to museums. Standing in context of something so impressive as the blue whale or a work of art by Pollack (I am a sucker for abstract expressionism) is a very physical and affective experience. It can be wondrous in the true sense of the word. Jackson Pollock. Number 1A, 1948.1948. Oil and enamel paint on canvas, 68″ x 8′ 8″ (172.7 x 264.2 cm). It’s something that I don’t think the AMNH website replicates or captures in any way – that sense of perspective, where you have an almost physical sense of your place in the natural world, in history, or in context of the lost lives and civilisations that have come before. I’m not sure of many museum websites that do yet. I also get it looking at the detail in this interactive 360 panoramic of the Strahov Library (though imagine how cool it would be if you could actually select a book from the shelf and look through it! ), and from You are listening to Los Angeles – an amazing sound space that combines random drone tracks from Soundcloud with the feed from the LAPD scanner. I was talking to a fellow museum/web geek yesterday about wonder, and he mentioned that it’s little things that bring him wonder, not big hit-you-in-the-face moments. He sent me to this beautiful site, and it reminded me that wonder and inspiration can come from simplicity too. So what about museums? Can we, should we, seek to capture people’s imaginations online in the same way we can in the flesh? Do we put the museum collection online only so that it is accessible for its own sake, and so that people can explore it if they are motivated enough? Or is there a way to create that same sense of perspective and discovery that the physical museum invokes, so that the museum website becomes as exciting a place to explore as the museum proper? Could something like this underwater diorama be developed to be as marvelous and informative as the actual ocean display at AMNH (with less glitchy looking animals)? Could you could click on the animals as they interact with each other, and get a grab of information about them, and explore hidden worlds through controlling where the viewer goes? Is this already happening? And could something like this, done well, inspire the sort of wonder and sense of exploration that the actual museum has? what things do museums do *exclusively* because of tradition? If you were building a museum from scratch, what would you do differently? I’m almost interested in the opposite question. What do museums do awesomely? If you were building a museum from scratch, what things would you try to replicate? I reckon wonder would have to be part of that. I don’t really know the answers, but I’d be interested in hearing whether there are any sites online right now that invoke wonder – museums or otherwise. ← Wait! Is MY museum a Mac or a PC?